It is the end of an era for our city. 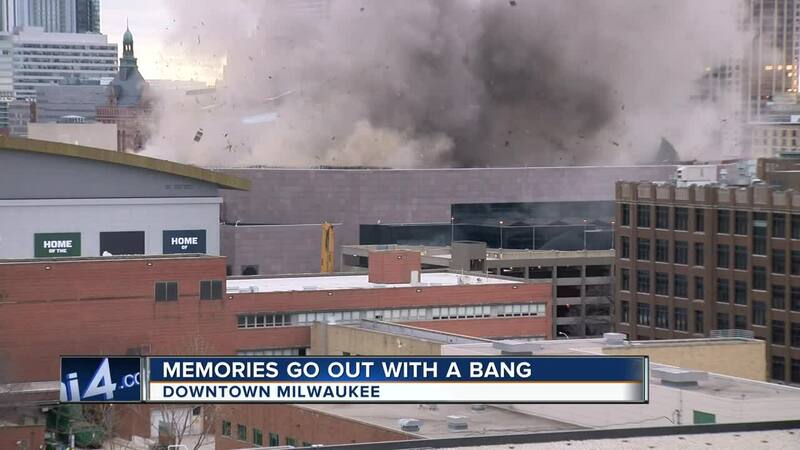 The BMO Harris Bradley Center's roof came down in a controlled explosion. MILWAUKEE - It is the end of an era for our city. The BMO Harris Bradley Center's roof came down in a controlled explosion. Dozens of people stood out in the frigid cold Sunday to watch it go down at about 9 a.m.
"I heard the boom, and I really felt that within me," said Raphael Rodriguez. Some people we spoke to traveled from Sheboygan to see the explosion in person. Others made it a family affair. Crews have been ripping out the inner bowl with heavy machinery since September. Now, it is time to say goodbye to the arena that housed the Milwaukee Bucks and other entertainment for three decades. "I've seen U2 at the Bradley Center, hockey games," Jenni Hofschulte said as she watched the roof come down with her 8-year-old son. "It just gave me memories of when I was younger, [such as] coming in with my brother to see the Bucks over the years. Seeing it go is sad," said Rodriguez. After the controlled explosion, our TODAY'S TMJ4 crew found debris that made its way onto the blocked off streets near 5th and State. Contractors have been hired to clean it all up. As the dust settles, team officials are searching for the right development to fill the entertainment district around Fiserv Forum. Some people out there today brought up the opportunities. "I hope new businesses come to help the city," said Rodriguez. "Upstarts for people of the greater Milwaukee area to have opportunity," said Hofschulte. Many possibilities, once the walls still standing are torn down for good.